Somebody needs to send the memo to Mother Nature that summer is just around the corner. Mother nature seems a bit confused as to how she is supposed to start behaving, it just wont be me. Rain, snow, fog and wind have all made regular appearances into June making for some very interesting conditions for photography. One of my favorite locations in Rocky Mountain National Park is The Loch, and when the weather is unsettled it always lives up to its billing. Abner Sprague is credited with giving the Loch and Loch Vale area its name. On a foggy or rainy day the landscape is certainly reminiscent of a Scottish lake though this is not exactly how the Sprague came up with the name. Abner Sprague guided many of the early adventurers through what was to become Rocky Mountain National Park. During one of these trips Sprague and his client Mr. Locke were hunkered down in a snowstorm overnight near Fern Lake. After surviving the night near Fern Lake with Mr. Locke, Sprague named a lake in his honor. Sprague named The Loch after Mr. Locke but instead altered Mr. Locke’s name more fittingly to that of a Scottish lake. 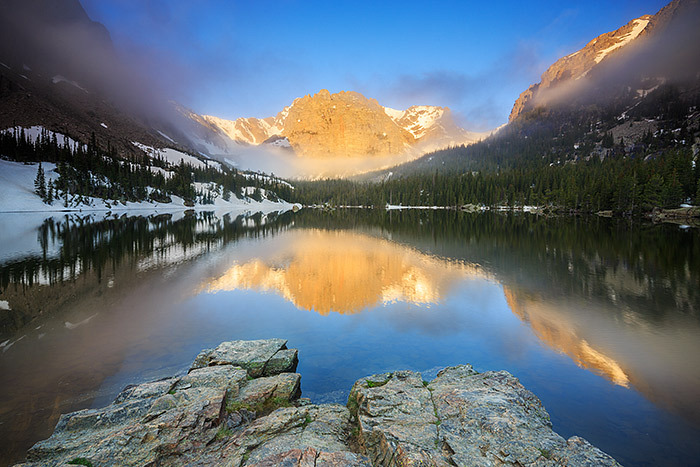 There are unlimited scenic wonders in Rocky Mountain National Park. That being said, anytime I have an opportunity to return to The Loch while dramatic weather conditions are unfolding I jump at the chance. It’s hard to pass up The Loch’s dramatic beauty which is only compounded when fog and clouds cloak the peaks surrounding The Loch in a veil like fashion. So when I arrived at The Loch last week and found the waters still and the peaks shrouded I took a good few moments to just sit and enjoy the silence and serenity before watching the fog and clouds lift from the valley while the peaks bathed in the warm morning sun. Posted in Colorado, Photography, Rocky Mountain National Park on June 11, 2014 by Tom Mangan. ← Previous: "Welcomimg Back Trail Ridge"